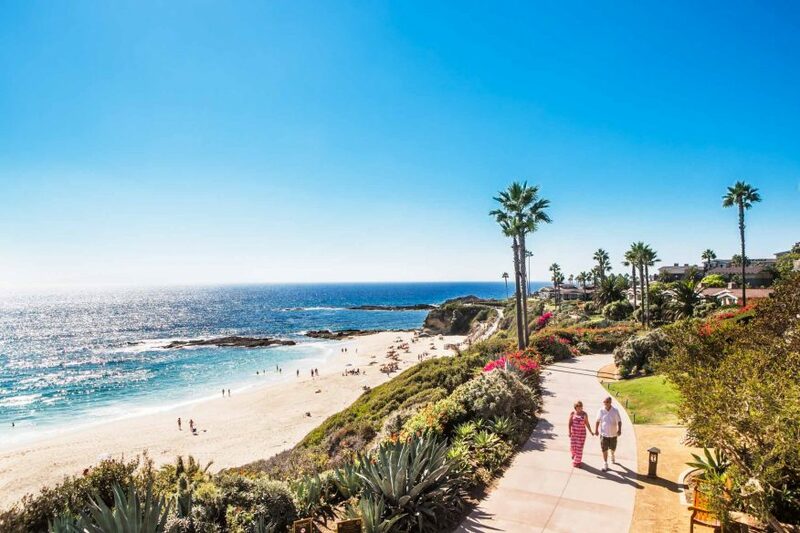 Laguna Beach is famed for its beautiful beaches and world-class art, making it the ideal place for a beach vacation with a spot of culture too. 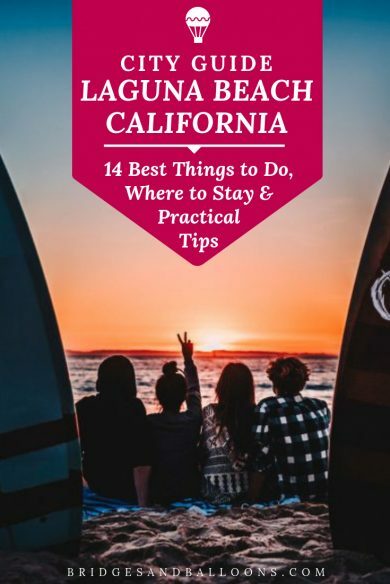 Spend the days relaxing on some of the California coast’s most beautiful beaches and then wander the town’s myriad galleries and public art. 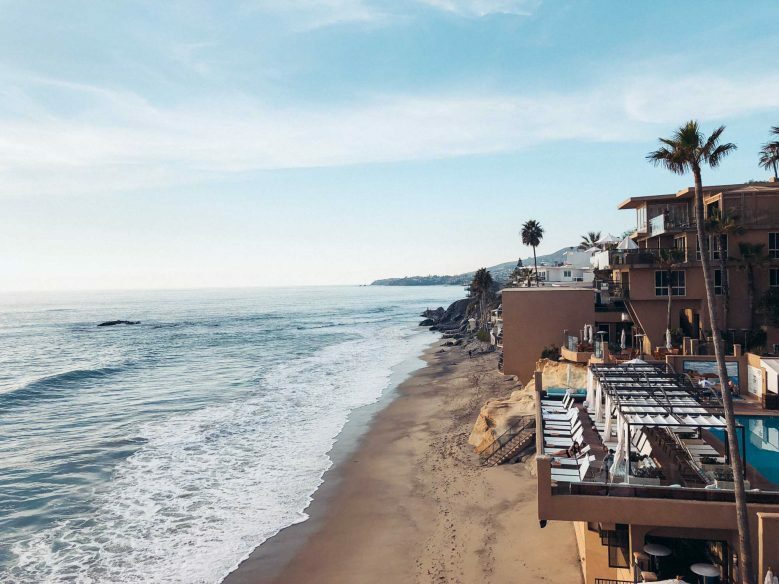 There are plenty of things to suit every taste, and this is our round-up of the best things to do in Laguna Beach. We loved Treasure Island Beach for its gorgeous views, private beaches and pretty cliffside park, which was ideal for spending time with Otis. 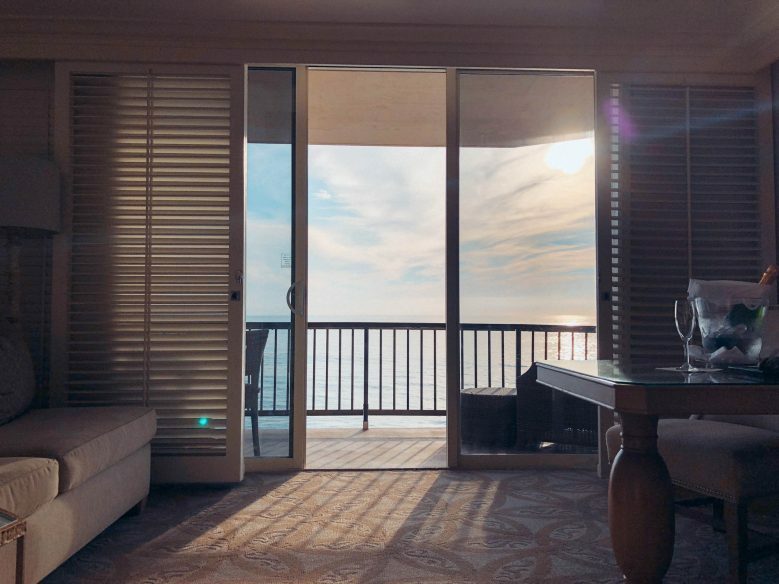 Our room at the Surf and Sand Resort is one of the most incredible places we’ve ever stayed. It’s right on the oceanfront, so we loved being lulled to sleep by the waves. The self-guided art-themed walking tour is a great way to be introduced to the city. 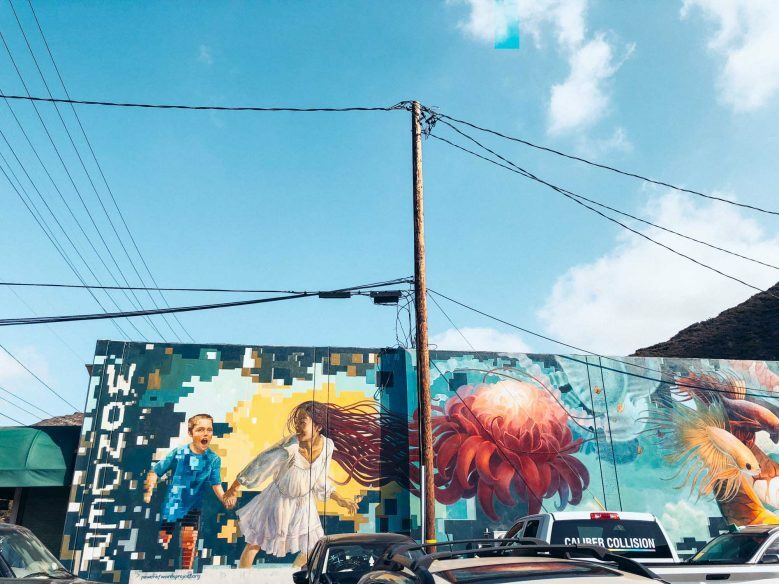 Drive down Laguna Canyon Road to see some brilliant murals and take your pick from the galleries that line the road. 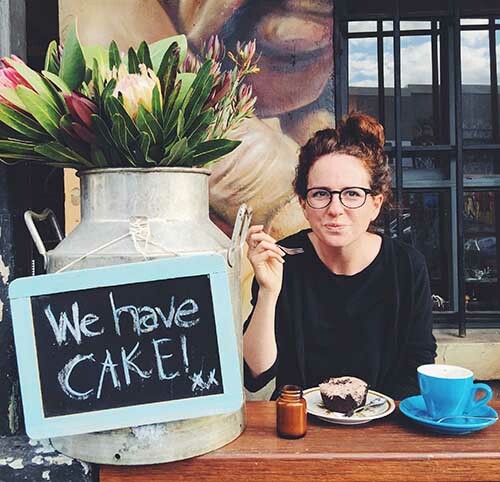 Sourced Collective put on monthly pop-up markets featuring local artists, crafters and designers. Find out the next dates here. There’s a weekly farmers market on Saturday mornings from 8am-12pm, featuring local produce. The luxury Surf & Sand resort is a spectacular place to stay. 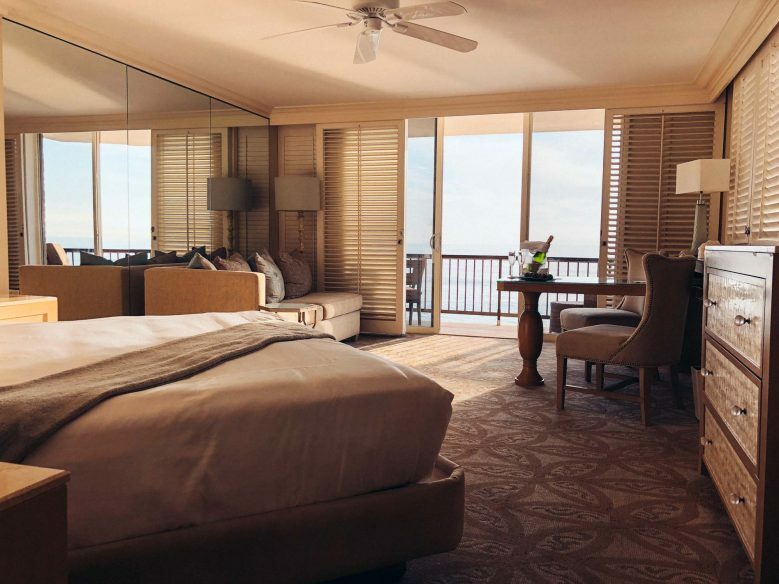 It’s right on the oceanfront and all rooms have an ocean view, so close to the surf that it almost feels like you’re on a boat. It makes for an incredibly special place to stay, listening to the waves as you go to sleep and watching surfers in the morning. 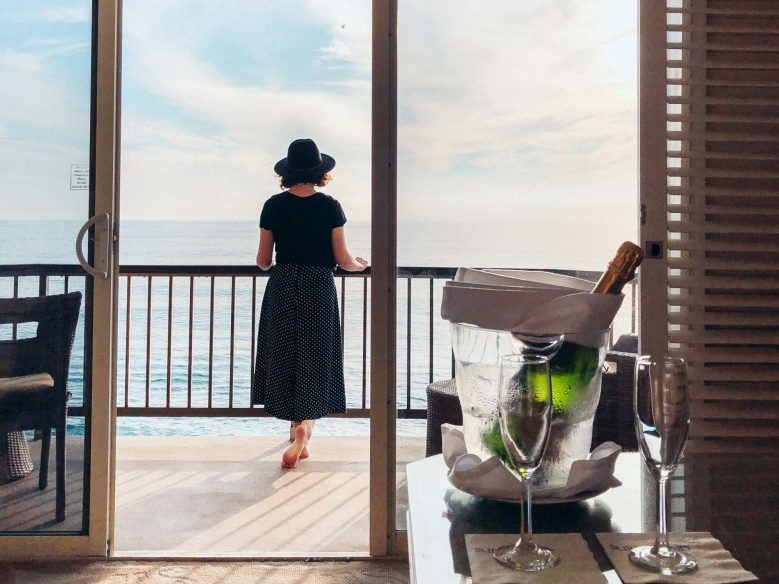 The resort is set on 500ft of Laguna Beach shoreline and, while family friendly, would also be a perfect romantic retreat. We ordered room service from the onsite restaurant to our balcony one night, which is a highly recommended treat. I’m still dreaming of the view from that room. 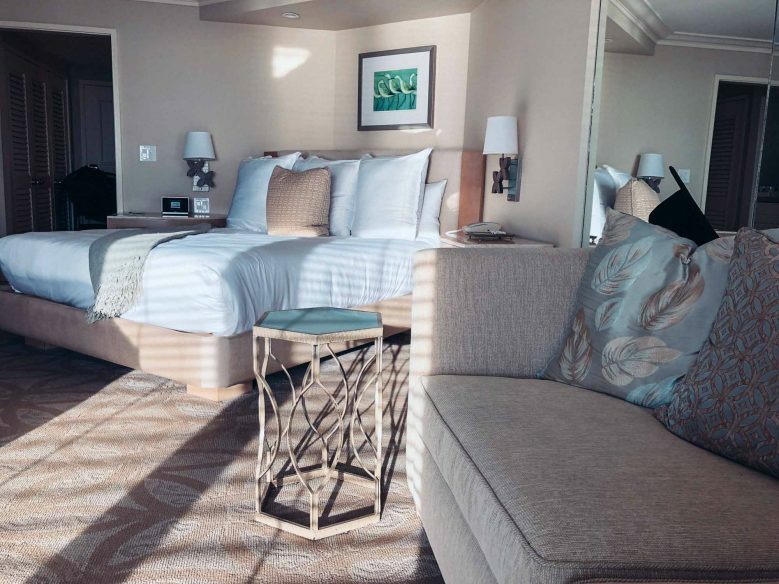 Rooms start at $385 per night. Find the best deals and book your stay now. 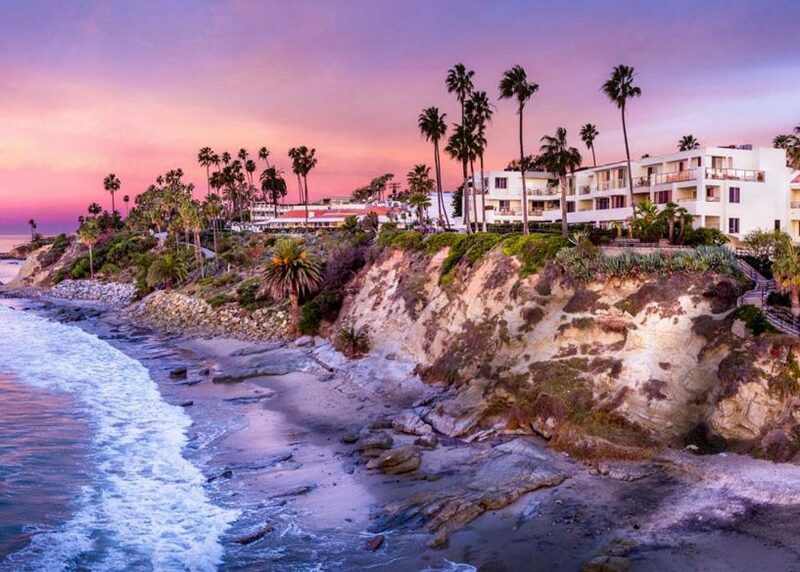 The Inn at Laguna Beach is a laid-back, luxury boutique hotel is in the heart of Laguna Beach, with ocean views and galleries, shops and nightlife just steps from your door. It has a laidback beach vibe and many of the room’s balconies look out onto the ocean The rooftop bar has fantastic views and guests are welcome to free wine every day from 5-6pm. Rooms start at $280 per night. Find the best deals and book your stay now. The Laguna Beach House is somewhat trendier sister hotel of the Inn at Laguna Beach. It has a dreamy California surf style with bright pops of colour against a white background. As with the inn, there’s complimentary wine every evening, and they also milk and cookies at bedtime. The Laguna Beach House is just a short walk from Main Beach and you can see the ocean from the pool. Rooms start at $200 per night. Find the best deals and book your stay now. You can easily walk around the downtown area, and at the weekends, there’s a free trolley that runs along the coast. If you don’t have your own car, you can easily use Uber or Lyft for longer journeys. If you do hire a car, be aware that parking is limited and traffic does get backed up along the busy coastal highway, especially at the weekends. That said, there are lots of parking options and is made easy by parking meters throughout the town. Most have a three-hour limit. We always hire cars through rentalcars.com where we have always found the best deals. Get the Laguna Beach app, which has real-time transit information, as well as lots of other useful information about activities, shops, restaurants and events. 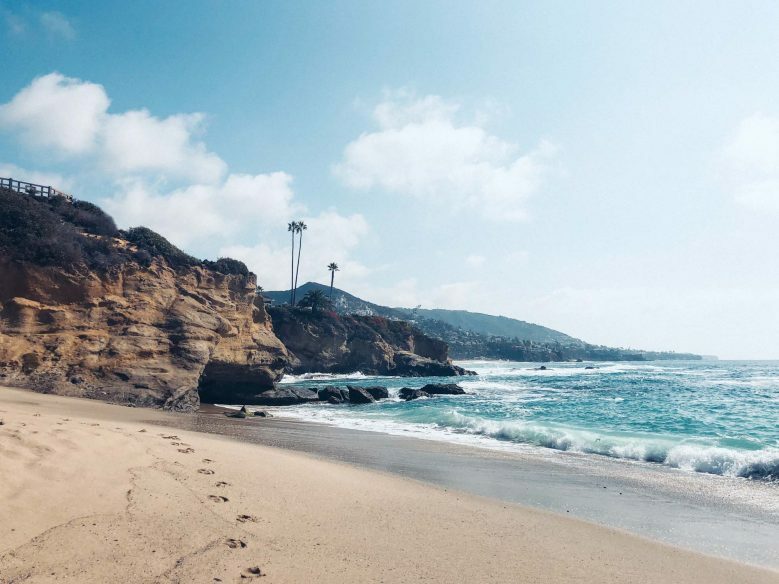 It’s super handy when working out what to do in Laguna Beach. 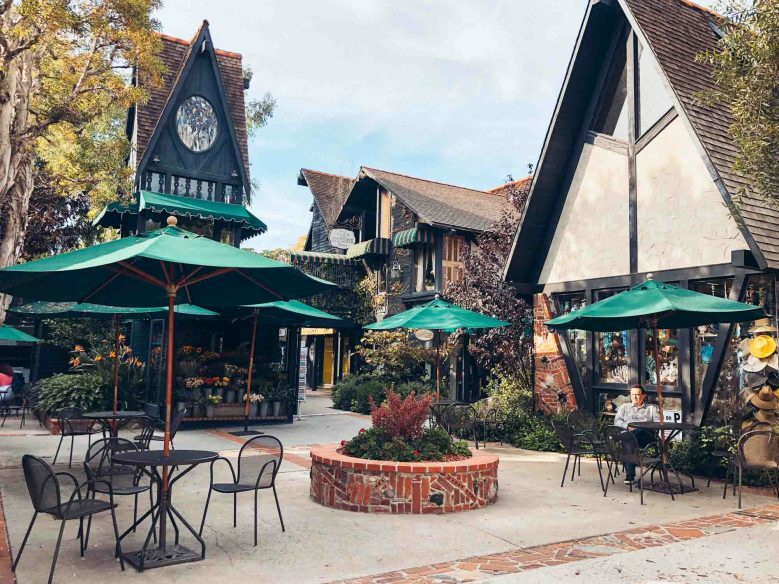 Janelle Naess at Laguna Beach Walks has put together some handy self-guided walking tours that are a great way to learn a little more about the city as you wander. We did the downtown walk, which points out lots of the public art installations and gives you details about each one. It was a lovely introduction to Laguna Beach and we appreciated being able to go at our own pace. There are lots of little galleries throughout the town as well as a selection of different exhibitions. 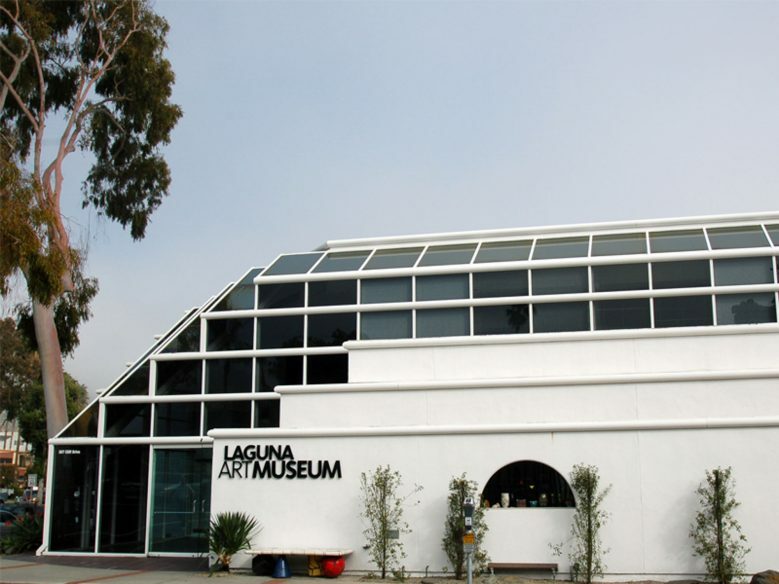 A good place to start is the Laguna Beach Art Museum, which houses an impressive collection of historic and contemporary Californian art, focusing on the cultural heritage of California. It costs $7 for adults; $5 for adults and seniors; and is free for under 12s. The museum is closed on Wednesdays. Also do the self-guided walking tour detailed above, and visit some of the little galleries, such as Kush Fine Art. And go to City Hall for a free exhibition of art by local artists. 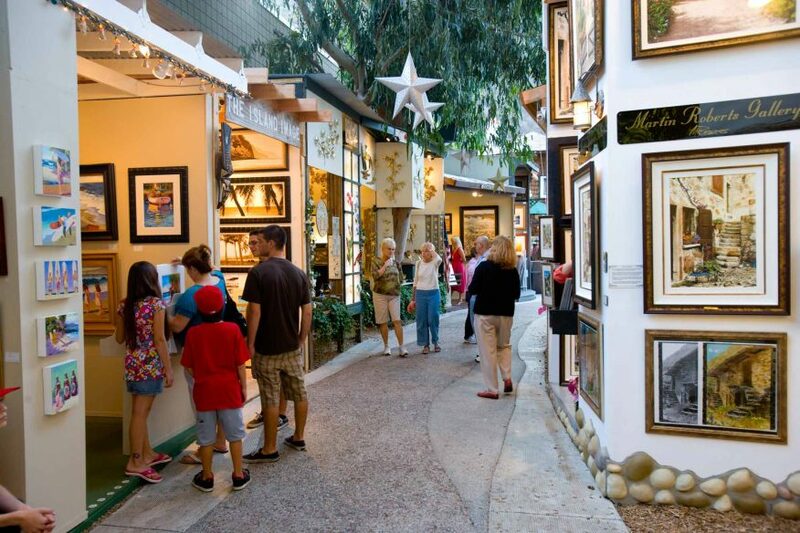 Visiting galleries is a must on the list of things to see in Laguna Beach. 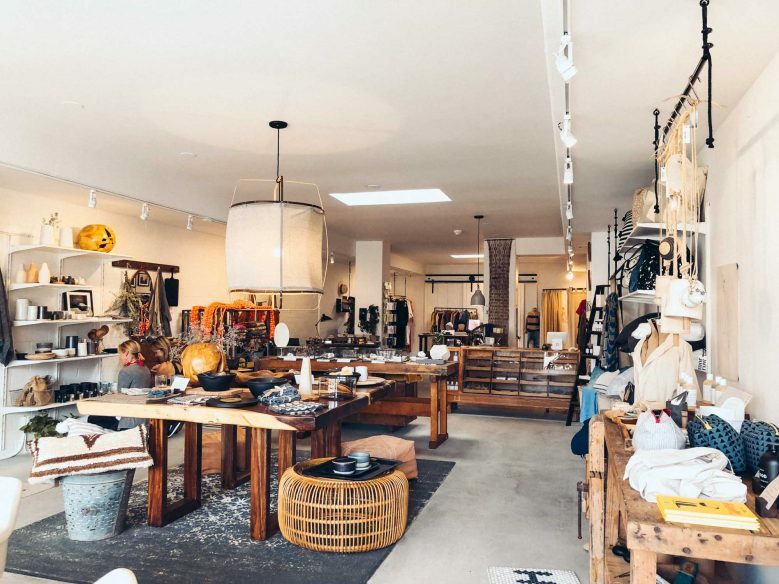 Laguna Beach is filled with over 100 independent boutiques, galleries and surf shops. Some popular options include: souvenir shopping at Fawn Memories; kids’ shopping at Little Bohemian, Little Freebirds, Buy Hand and The Soul Project; home goods and unique gifts at Tuvalu, Vertigo Home and Brass Tack; for special home goods and unique gifts; and clothes shopping at Amenah, Simple Laguna and Thalia Surf Shop. 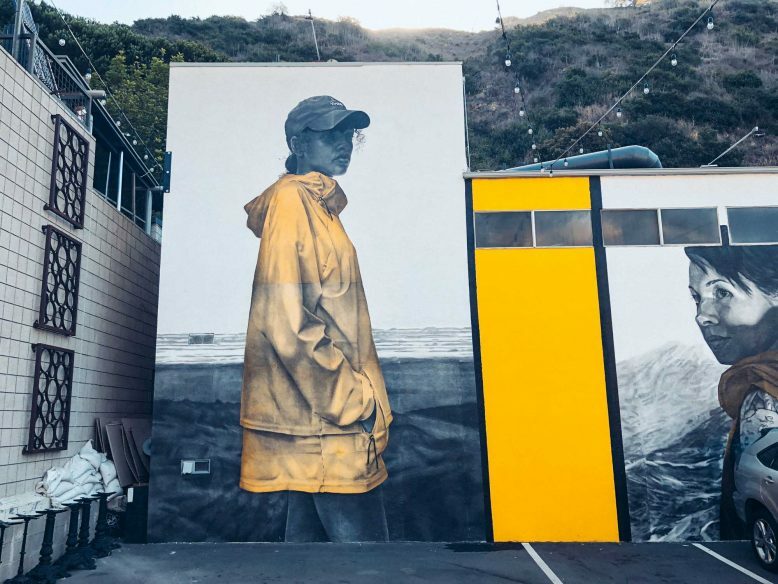 Laguna Beach has an annual programme of exciting art events, including the Laguna Art-A-Fair, which features 120 international artists where you can browse their work and meet the people behind them. 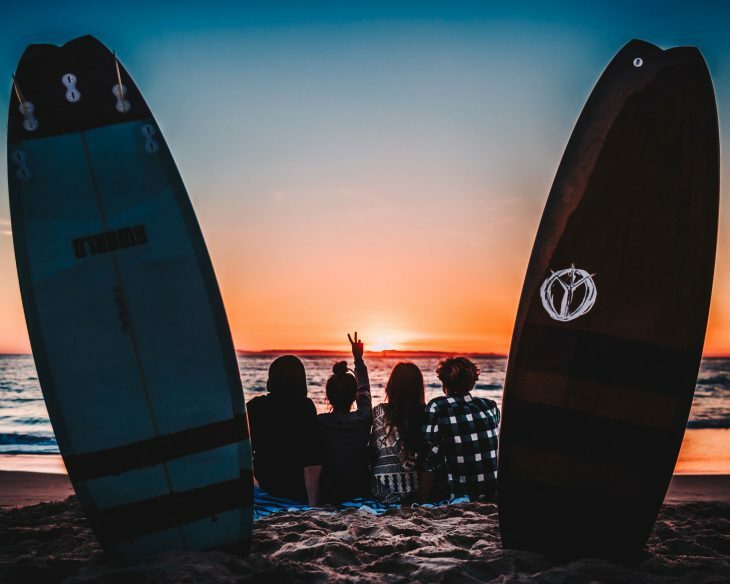 Other popular options are the Sawdust Art Festival, and the Festival of Arts and Pageant of the Masters, which are both among the top things to do in Laguna Beach. A popular Laguna Beach activity is spotting sea life in the tide pools throughout town. Treasure Island is a good spot, as well as Main Beach and the Heisler Park area. Remember tide pools are fragile ecosystems, so don’t touch or remove any of the sea life. Find out more about what you’re looking at on the Laguna Ocean Foundation website. 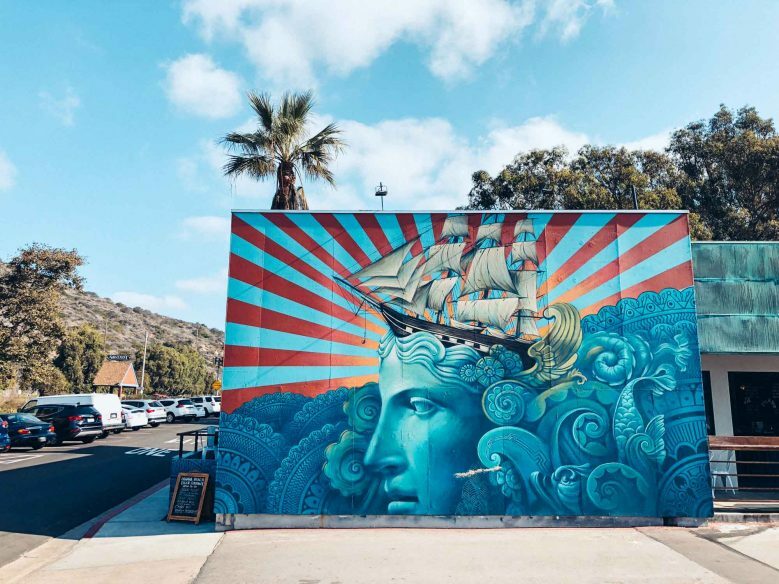 Laguna Canyon Road has some excellent murals, including at the parking lot of Laguna Beer Company; the parking area at 837 Laguna Canyon Road; and at the Laguna College of Art and Design. 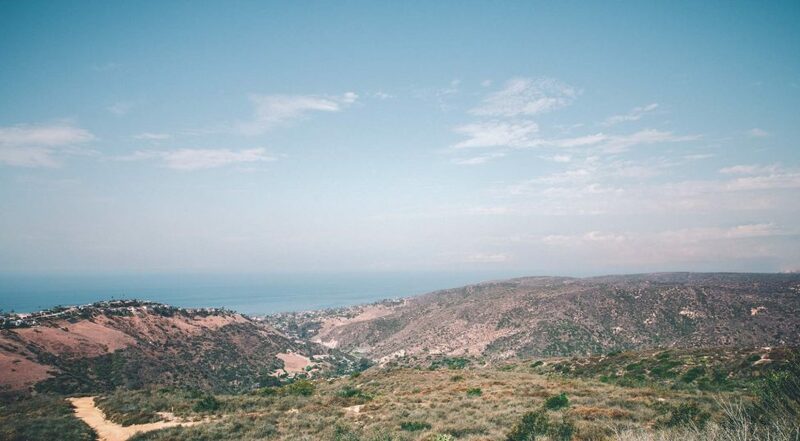 While there, also visit Laguna Canyon Artists studios, which house more than 30 professional artists. 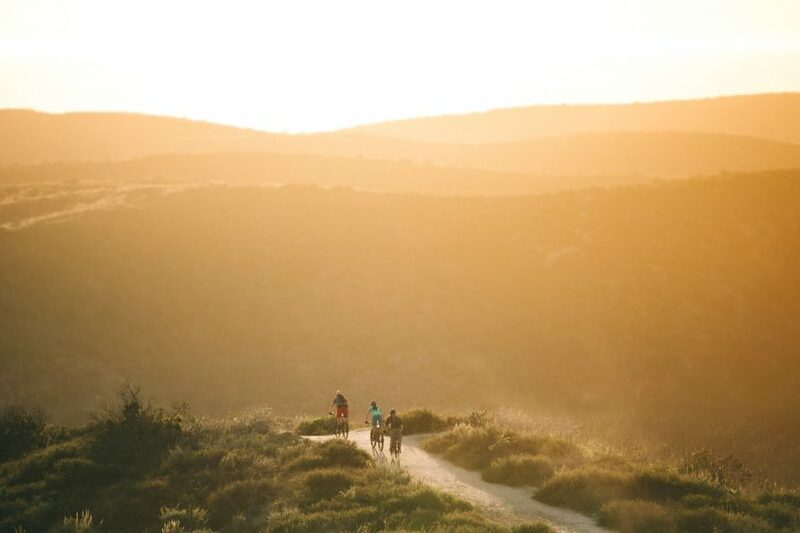 Choose from 40 miles of trails through oak and sycamore woodlands in the Laguna Coast Wilderness Park. There are some fabulous views along the coast. Start your journey at the Nix Nature Centre, which offers lots of activities, including mountain biking and birding. Another highlight is Barbara’s Lake, which you can hike to from the Nix Nature Centre of the James Dilley Preserve. Trail maps are available on the website. 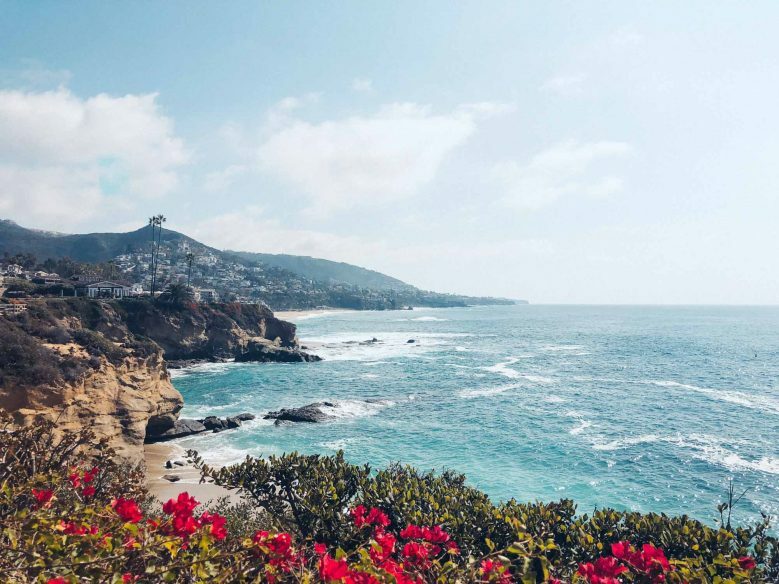 Heisler Park is a gorgeous oceanfront park in Laguna Beach where you can enjoy expansive views and take a walk down to the beach. It’s on a bluff above the beach and if you’re lucky, you might spot some whales. The park is also home to lots of sculptures. 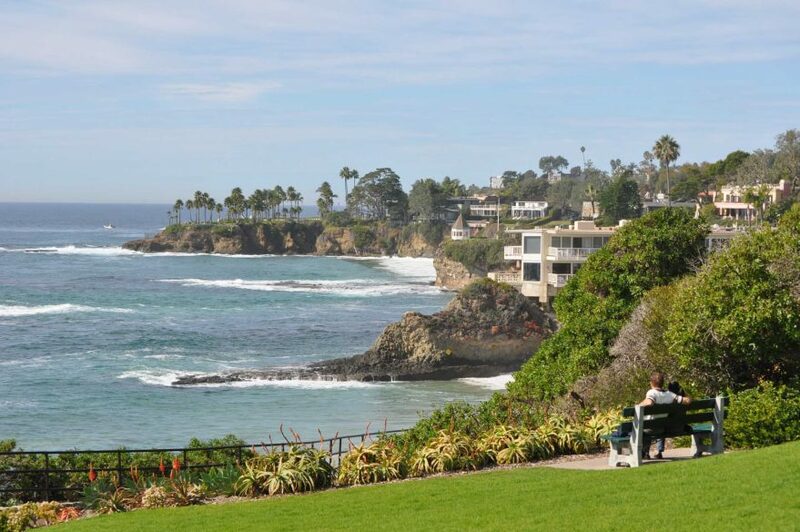 One of the Laguna Beach self-guided walking tours is a tour of Heisler Park. Find it here. 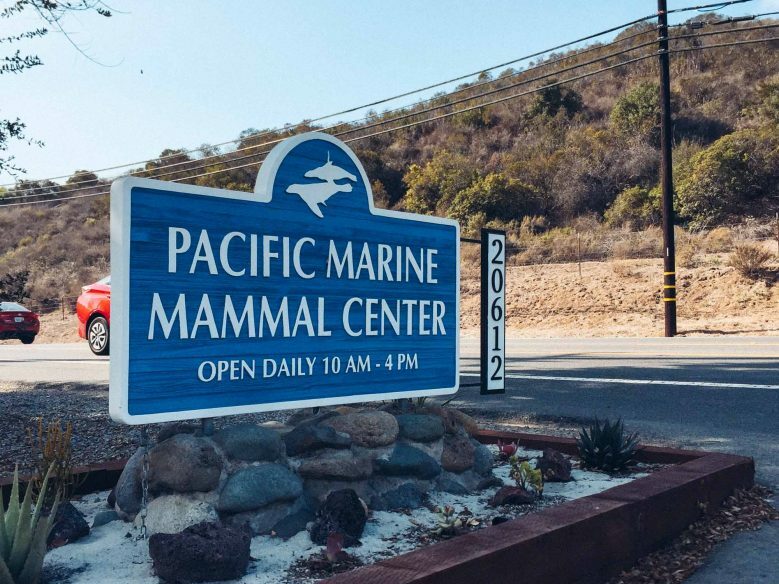 The Pacific Marine Mammal Center rescues, rehabilitates and releases marine mammals along the 42 miles of Orange County coastline. Visit to learn more about the centre’s work and get a chance to see some of the patients. It’s free to visit, although donations are very welcome. As with most of California, Laguna Beach has taken up the state’s love of craft brewing. The Laguna Beer Company has a variety of beers on tap and has a great family-friendly atmosphere, including colouring books and board games for kids. Also visit the Laguna Canyon Winery to try the homemade, award-winning wines. 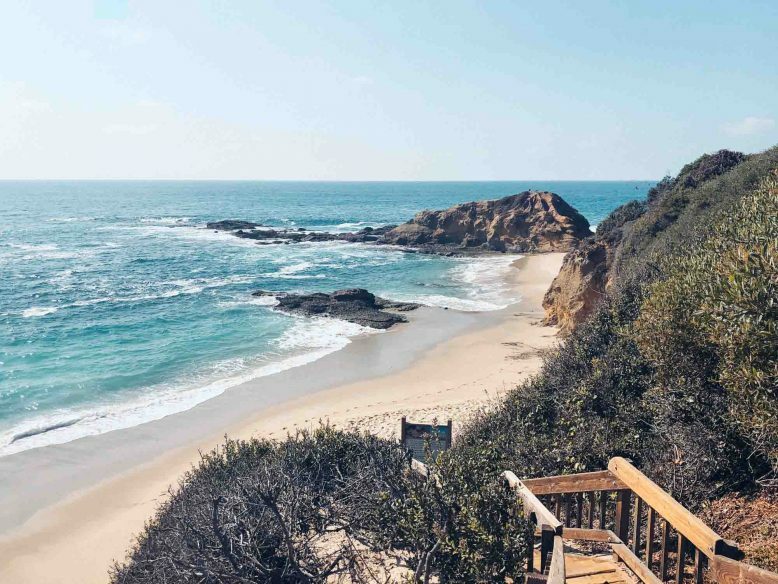 A wonderful place to experience the beauty of Laguna Beach is Crystal Cove State Park, which includes three miles of coastline, sandy beaches and wooded canyons.It’s a good place for hiking, swimming, biking, surfing and scuba diving. 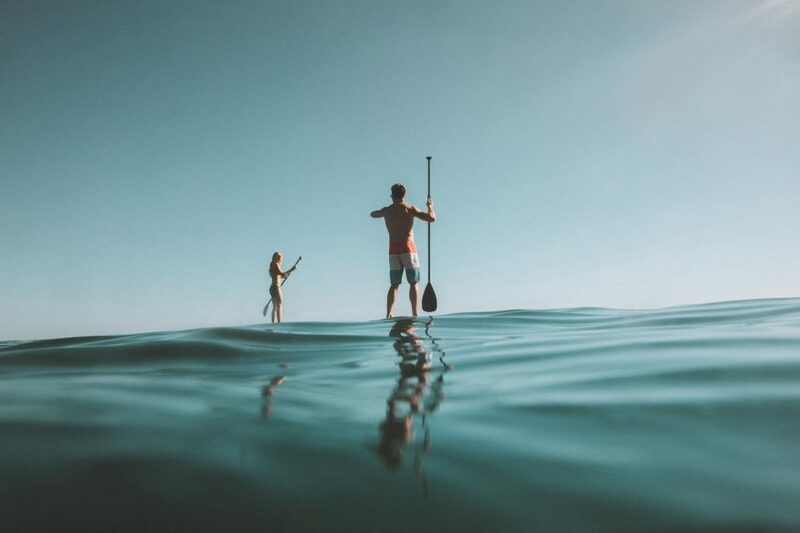 Laguna Beach has plenty of water sports to try. Try stand-up paddle boarding or do a kayaking tour with La Vida Laguna. Or arrange some surfing lessons with Thalia Surf Shop and Laguna Surf & Sport . 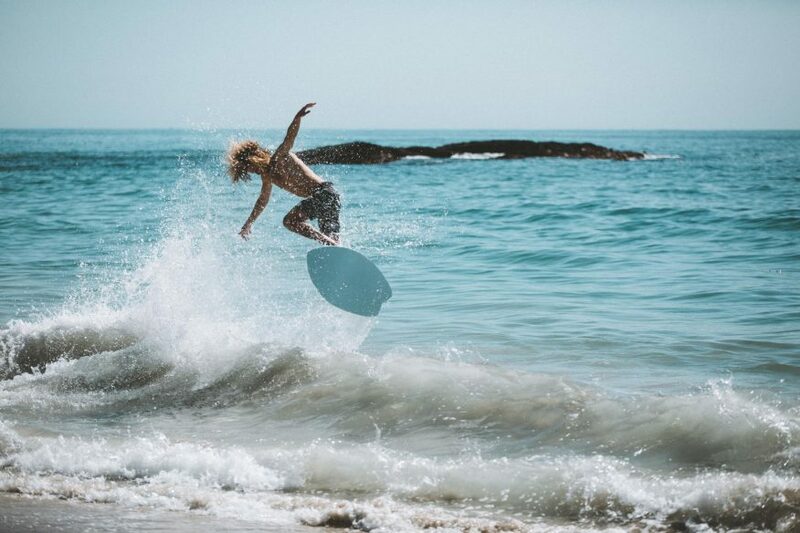 Skimboarding began in Laguna Beach at Victoria Beach, so it’s a good place to give it a go. 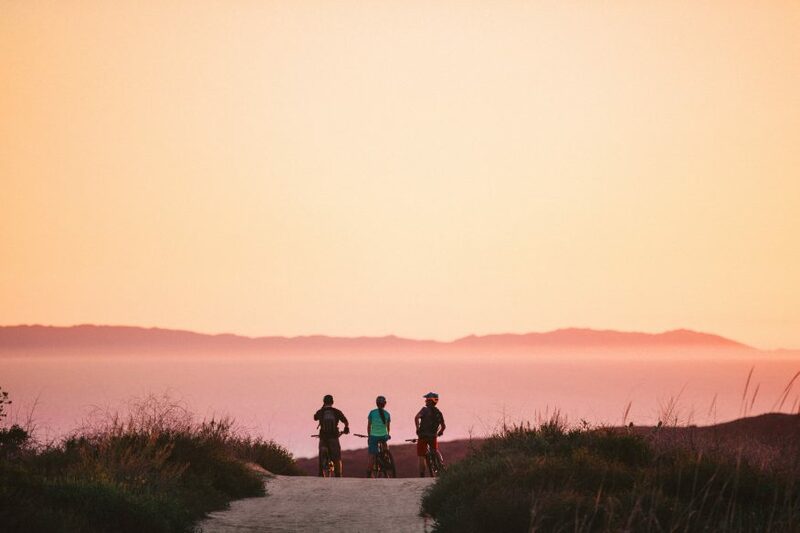 There are no end of fun things to do in Laguna Beach. 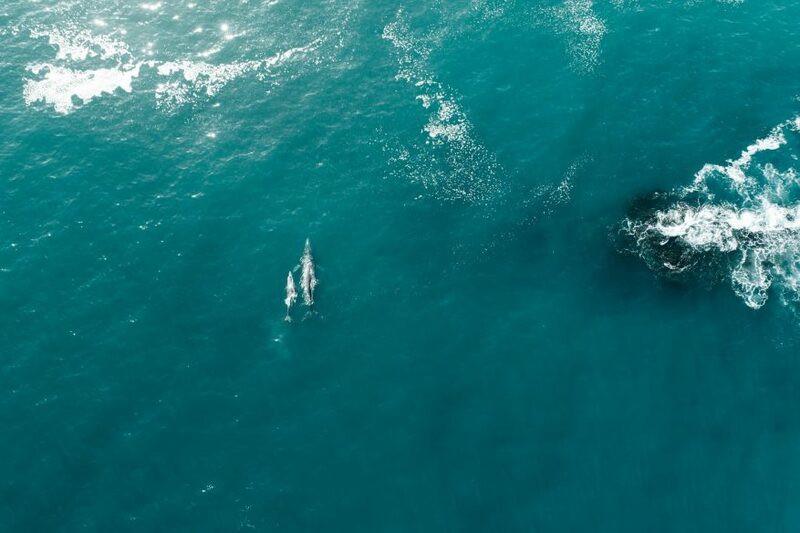 You can see whales off the Laguna Beach coast all year round, including giant blue whales in the summer and autumn, and grey whales in winter and spring. Species that can be seen all year are finback whales, humpbacks and dolphins. Places that offer whale watching tours include: Newport Landing Whale Watching and Captain Dave’s Dolphin & Whale Watching Safari. Don’t forget your travel insurance! We recommend World Nomads or True Traveller who both offer reliable, comprehensive cover, including medical, evacuation, baggage and a range of adventure sports and activities. You can buy both True Traveller and World Nomads insurance even when you’ve left home, which is unusual for travel insurance companies. If you decide to hire a car, book with Rentalcars.com. We find they always have the best deals. And check out more of our detailed itinerary posts here. Found this useful? Share it on Pinterest! Disclosure: Visit California and Visit Laguna Beach helped put our trip together and sponsored our stay. And our car hire was provided by Rentalcars.com. Please note that regardless of sponsorship, all opinions are always my own. Read our policy on working with brands here.